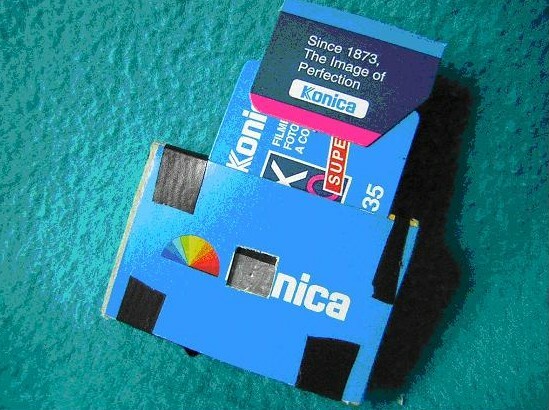 If you’ve always wanted to make the simplest of all cameras, a pinhole camera, you’ve come to the right place! 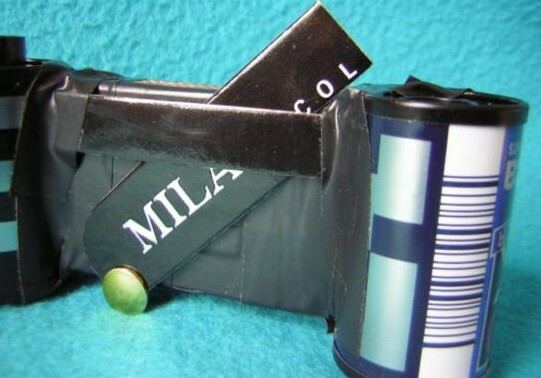 Build a superb pinhole camera for FREE!! In these days of multi-megapixel digicams producing high resolution photographs, wouldn’t it be nice to go back to the days when photography was simple and demanded very little from you apart from a little ingenuity and perseverance? Even though I have been dealing with some very sophisticated cameras, I do sometimes reach a point of saturation when just talking about f stops, fungus, shutter speeds etc gets so annoying, that a break is often called for! So at times like that, I leave the house and disappear into my little shed at the bottom of the garden. This little space (and it is little–very often there is hardly space to sit down and more than likely I end up standing, as there is so much stuff in there) is my bit of peace, quiet and tranquility. All members of my family have been warned not to disturb me when I am in there, unless it is a dire emergency, so once I am inside there, I can rely on being left alone for as long as I like! 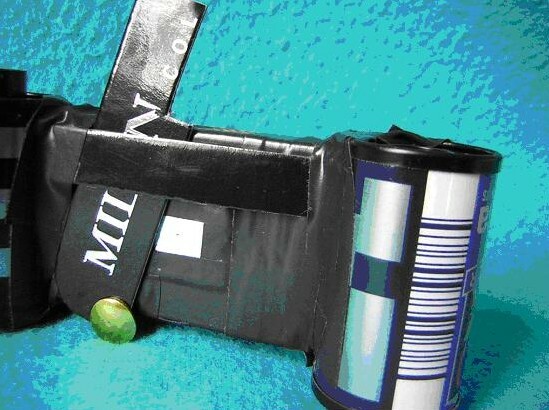 Anyway, it was during such a time that I was taking a break by fiddling around in my shed, when I hit upon an idea that I often had been thrashing about in my mind – that of building my very own pinhole camera. As I had the time to embark on this long-awaited project, I hit myself in the foot by deciding to introduce some strict guidelines with which this task was going to be done (and of course in doing so, the stress levels shot up again !!). The camera would be built using whatever materials I had in my shed, and nothing else! This was something I should have thought about before I decided to do it, as most of my “stuff” lies in my study (well, I like to call it a study but it is actually the smallest room, built right at the end of the very long garden, and is absolutely chock full of all kinds of wonderful detritus that I have been hoarding since when I was not even a teenager – things like Airfix model aeroplanes, electronics kits, old magazines, newspapers, even some of my old secondary school exercise books!). So I looked around in the desk in front of me in the shed, rummaging around in all the many little drawers containing boxes, pill-bottles, old bicycle puncture repair kit boxes, film containers, even a little box that was used by my grandfather to keep his false teeth in!) 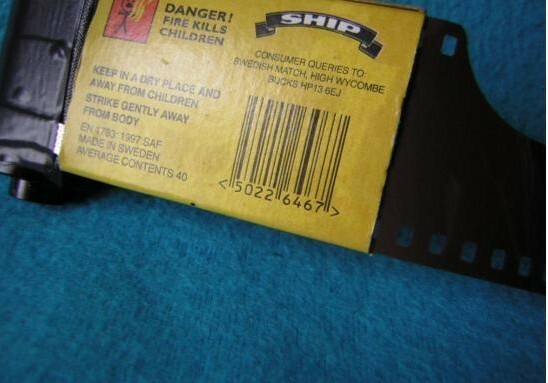 and found a matchbox that in my mind’s eye looked just about the right size for the body of a camera. In fact I tell lies here, as at first I wanted to use an empty cardboard film container, but that I found to be a little flimsy, so in the end I opted for the matchbox. I also got together an old Stanley knife, a tin of drawing pins, some cardboard tags that had come with a pair of Italian shoes, black pvc tape, a black marker pen, a roll of sellotape, a plastic ruler and finally a pair of scissors. You may be saying where was I going to get the film – well, the answer to that is I always have some rolls of film in my shed…….oh, alright, I’ll tell you one of my other secrets (as the wife is bound to find out soon anyway! ); I sometimes tell my wife that I’m going to do some work in my shed, but when she’s not looking, I load up my little Rollei 35 with film and make a perfect escape through the gate behind the shed, and into the lane leading to some woods – freedom at last! Ok, now that you know at least one of my secrets, let’s see what I did next. 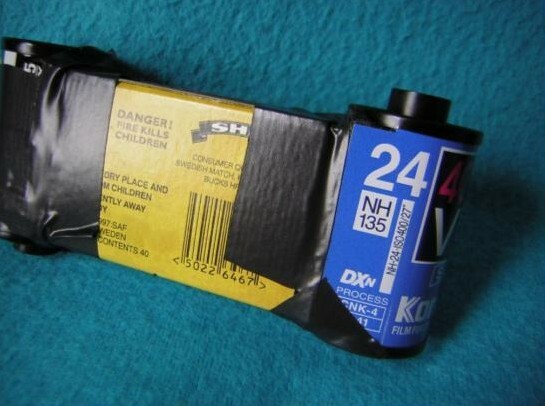 Now, as you all probably know, the roll of film you buy in your pharmacy or supermarket (or, if you are lucky, a real camera shop), is usually 35mm film that is of a frame size of 24mm by 36mm, and which will give you either 24 or 36 exposures, depending upon the type you have bought. 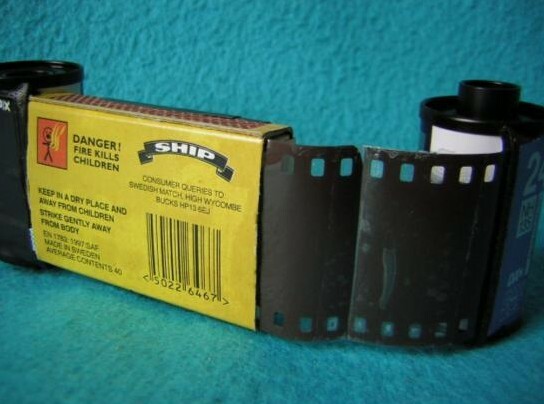 So, bearing that in mind, I thought about changing the format of the standard 35mm film to a square format. 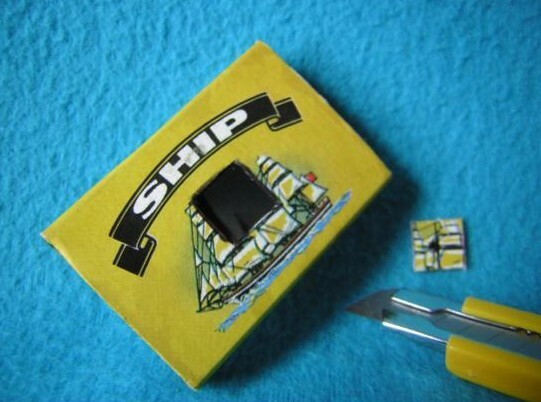 I was going to do this by measuring this square size onto the matchbox. This would give me something totally different to what everyone gets from 35mm film and would allow me to hopefully get square photos as well, something which I have not seen done with 35mm film, although 120 roll film is usually the medium for square photos. Righty-oh then – I just about had everything I needed, so I made a start by fiddling about with the matchbox and length of film from the 35mm canister, trying to work out how the film would run through the box, how it could be held as flat as possible (the secret of sharp photos), how would I know how many frames had been wound on from the film, how to know when the film had finished, what to use as a lens and how to find a solution to providing a shutter. What a nightmare! And this is how I relax, you may ask? 1 How would the film run through the matchbox? 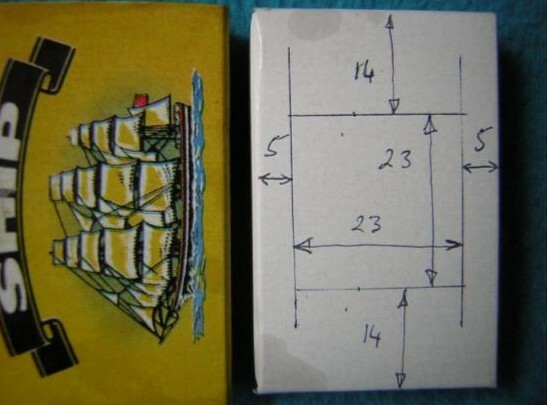 2 How would the film be held flat in the box? 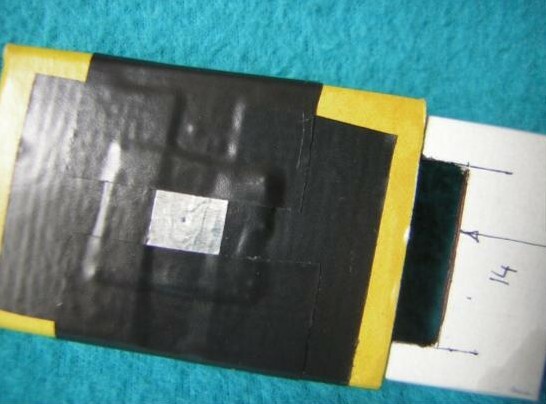 In order for the film to be as flat as possible, it needs to be held quite securely and tightly. The only way to do this using the materials I had would be to use the sliding tray, as this fits in really snugly, holding the film flat. Then I hit upon using the tray as a template with a square hole cut into it – that would achieve my target of square photos from a 35mm film. 3 How would I know when the end of my film had been reached? This was a very tricky one to solve! I tried using a piece of plastic stuck on the take-up reel, marked on one end to show the start of the first photo, etc. That did not seem practical. 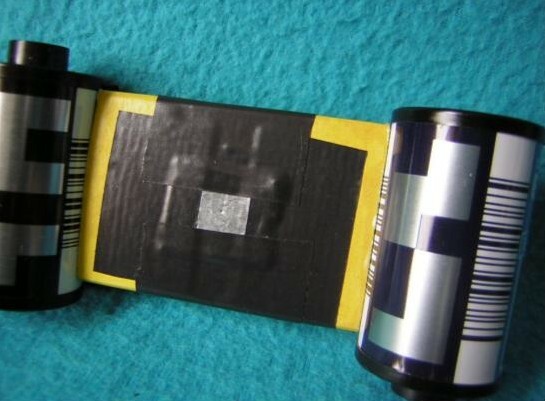 Another way would be to count the slots in the film as they went past a point, but trying to show the slots through the matchbox would obviously expose the film, this was not practical either—talk about problems! Finally, I managed to suss out that the only really reliable way to count the frames would be an audible method. 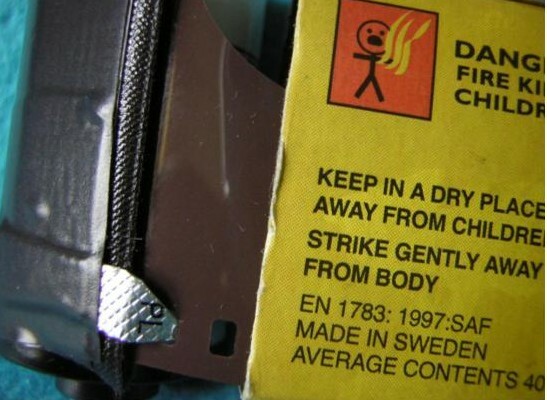 This is where a bit of clever trickery was used. I cut a little piece of plastic from one of those pill dispensers you can buy these days. 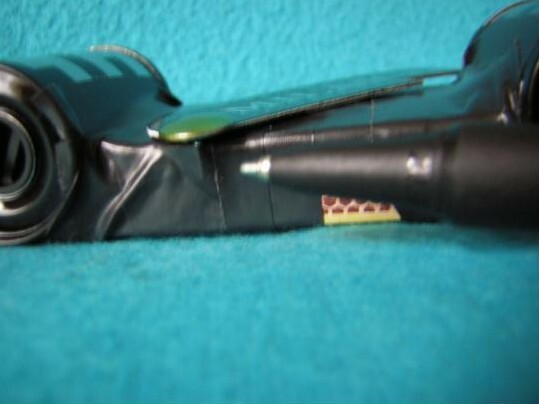 That piece of plastic was fitted to click into the slots every time the film was wound, which would create an audible click. Then it was just a matter of counting how many clicks would mean 1 frame – in this case, it was around 6 clicks. 4 What would I use as a lens? This was easy – although I did initially want to use a home-made lens or one from a plastic camera, that would make this thing look more like a real camera, which I did not want. So I opted for the classic lens as used by the first photographers in history – a pinhole! More details on how I did this below. 5 How would I set up a shutter to expose the film? Here again, it was just a matter of improvisation. I tried various methods ranging from a scrap of paper over the pinhole, to a sliding piece of card, and even a circular cardboard with a gap in it. However, none of these looked any good, so I finally hit upon using a cardboard lever affair that you slide from one side to the other, which either opens or closes the shutter. Very simple, but very effective! Ok, that’s all the talking over! Now let’s see how to actually do it. Ok – done that? Fine. 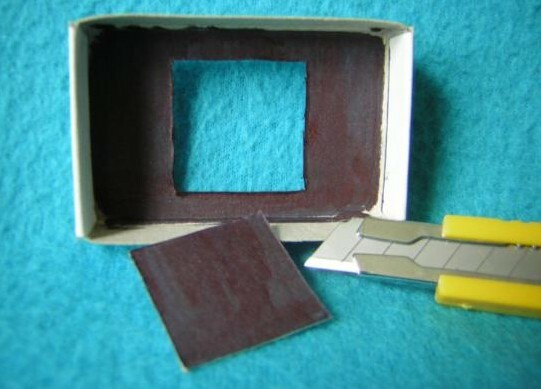 Next thing to do is to colour or paint all the previously cut matchbox tray with black – this is done so as to prevent flare caused by stray light leaking into the camera. 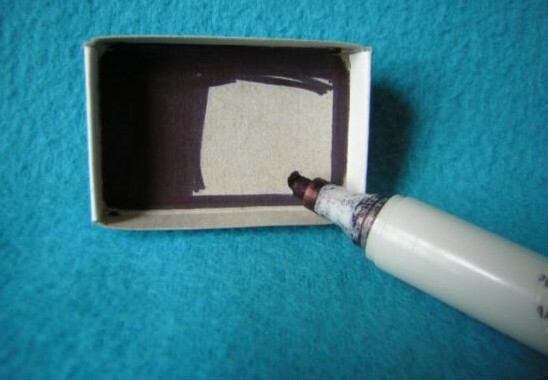 By the way, it’s also best to paint or colour the inside of the matchbox sleeve itself as well, as you want to prevent any light from being reflected from any light surface onto the film. 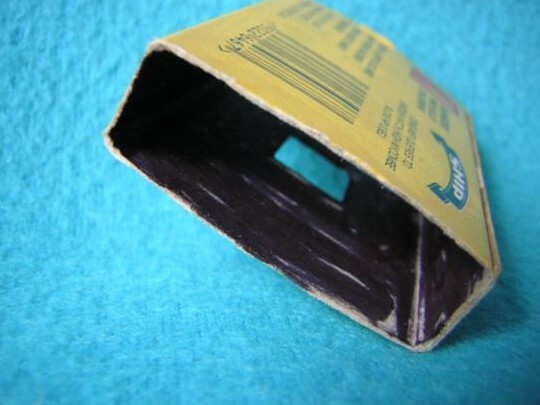 Now what we need to do is to cut a smaller square out of the matchbox sleeve itself, and this is where the pinhole “lens” will be attached. Getting the exact centre of the sleeve in order to cut the hole can be quite difficult, so the way I did it was to place the matchbox tray on top of the sleeve lined up exactly on all sides, with a pencil draw around the 23x23mm cut you have already made, then take the tray away, and you will be left with a 23x23mm square drawn onto the sleeve. Then draw 2 straight lines from corner to corner in the box you have just drawn. The point where the 2 lines cross is the exact centre. Clever, eh? Now we come to the critical part of this whole project, and that is making our “lens”. 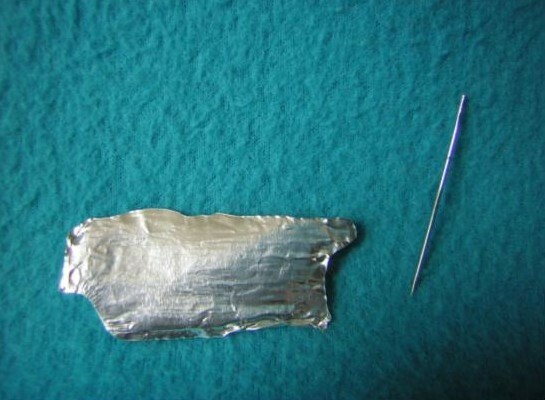 For this, we are going to use a piece of foil that collected earlier. 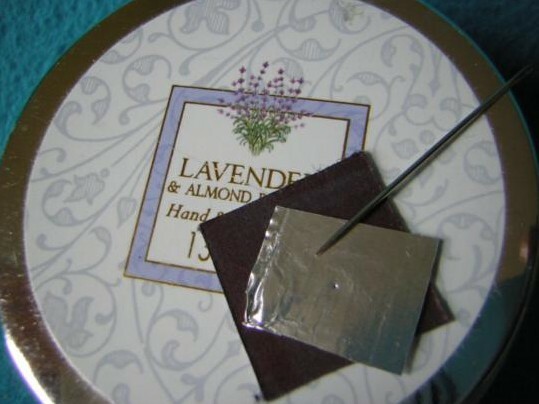 Before I show you how I did it, let me mention here about what kind of foil to use. 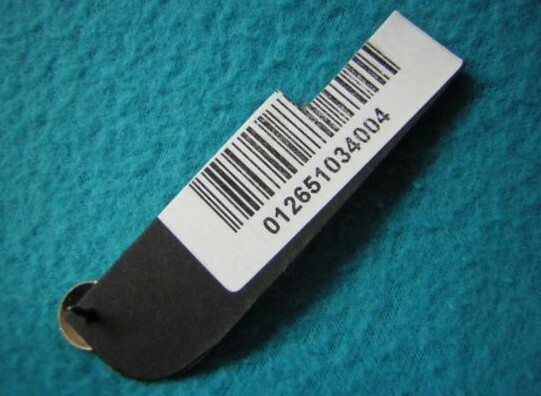 The reason is that there are different types and grades of foil – some are very thin and not really suitable for our use. I actually used the piece of foil that I cut from one of those foil containers you get when you buy a ready-prepared salad or Chinese meal. The foil these containers are made from is of a sturdier grade. Failing that, you can always use a piece of cooking foil. Ok; measure and mark gently a 15mm square onto the foil and then cut it out. Ok, that completes the major part of the project – phew! Now what we need to do is to make the “clicker”, which is a clever little thing that tells us when the next frame is ready to be used in our camera. 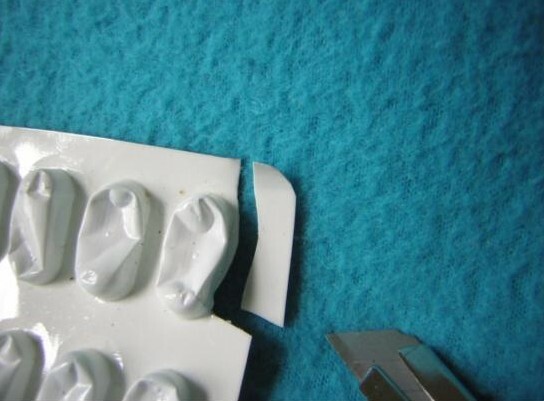 For this, I used a piece of plastic cut from one of those flat tablet dispensers aspirin or paracetamol is often sold. Now all we need to do is to attach the end of the film to the take-up spool. Make sure that the matchbox tray is in place at this stage and is correctly placed, ie it’s square hole should be in touch with the film being passed through the matchbox. What I did here was to take a scrap film, pull out all of the film from the canister, leaving about 2 inches protruding from the canister, and cutting the rest off. Fine – with that done, now all we need to do is wind up the film slightly from the take-up side in order to bring both the supply and take-up spools as close as possible to the edges of the matchbox, as this is where light could get in and expose all the film as it passes by. 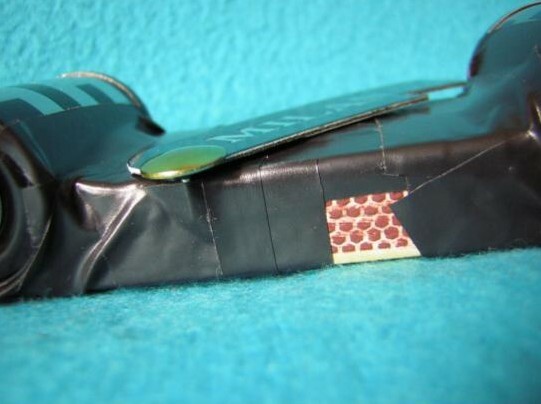 Note that this side also needs to be sealed properly with black tape at the points where the film canisters meet the matchbox. If you have lasted up to this point, take a break for as long as you want, have cup of tea, shot of whisky or maybe just go for a walk and come back refreshed!! It’s just as well you have taken a break, as the next bit is a bit fiddly – fitting a shutter to your camera. For this, I used a strip of card cut out from a shoe label! One corner of the strip was cut in a round shape as you can see, and this allowed the strip to swing through an arc without being caught in any part of the contraption. 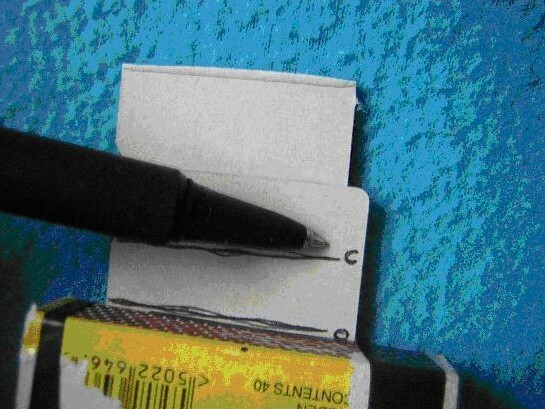 The drawing pin was pushed through carefully at the other corner. 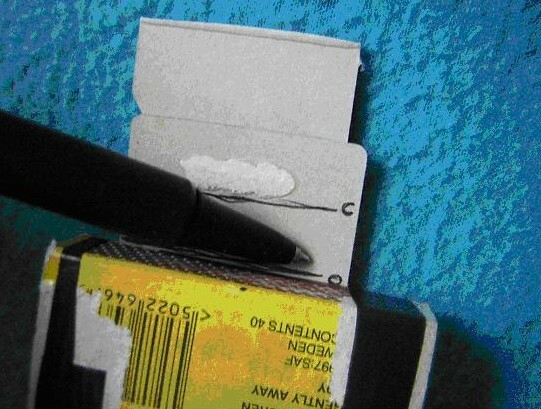 The whole strip was the stuck to the matchbox, just to one side of the pinhole. What this does is to create a bit of friction on the bottom of the take-up spool, thereby preventing the film you have just wound from sliding back past the pinhole, which could cause double-exposure (unless you specifically wanted that effect!). 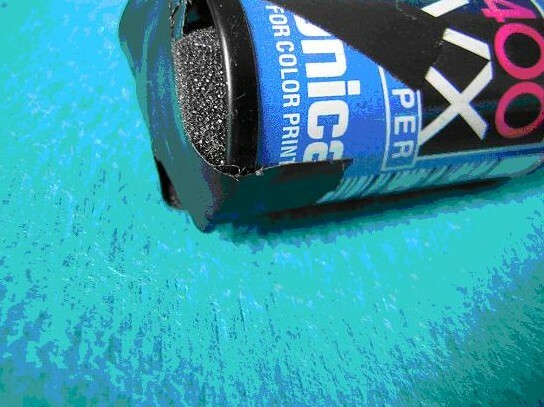 In any case, the “clicker” we fitted to the supply film cassette prevents the film from accidentally winding back, but this foam will add that extra bit of friction. No – I want a different kind of shutter! Ok, if you find that this type of shutter does not work, or lets in light or you just want to be damn awkward, then I have another style for you here! This will take almost the same time to make as the one above but is slightly more fiddly. Fine. Ok, whereas the previous shutter worked sideways, exposing the pinhole for whatever time you wanted it to, this other method works in a different way. 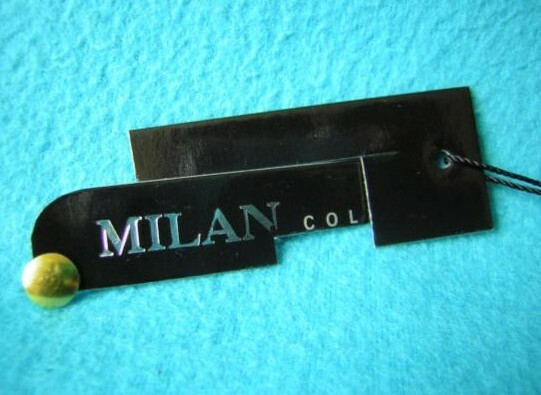 This type of shutter slides up and down, alternately exposing the pinhole and closing it. 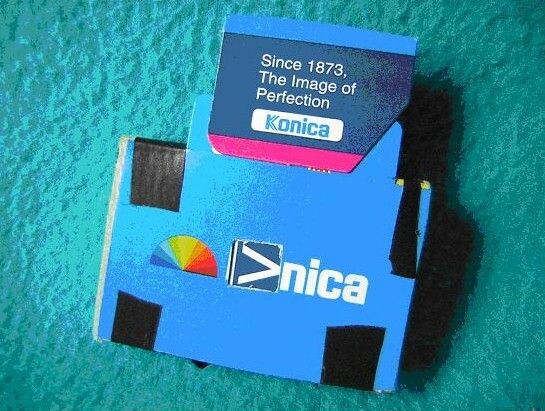 As I was using Konica film for this project, I decided to use their carton which the film comes in. In passing, I just realised what a mug I am for using their name in this project (and so openly displayed, too!). I mean, I could easily well have claimed some cash from them, as they have got a free mention here and their logo is displayed for all to see, giving them free advertising!!). 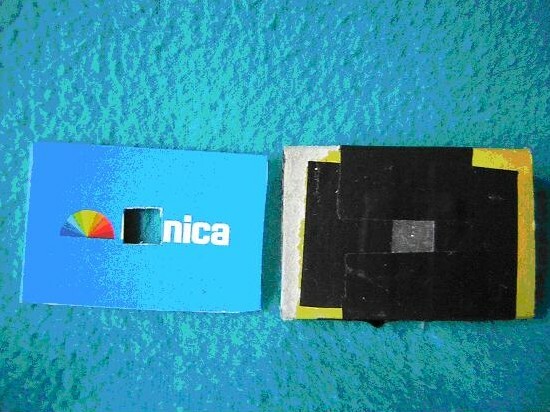 Next, we fix this piece of card to the front of our matchbox camera as shown. What we must make sure here is that the any tape used to fix the card onto the matchbox is not covering any other part of the camera apart from the edges. The reason for this is because the shutter we will be using, will actually be sliding up and down between the new piece of card and the matchbox front, and we don’t want anything disrupting the travel. Right, with that done, the next task is to make the sliding shutter itself. This is obviously done to make it easier for you to know exactly how far to slide the shutter up or down when taking a photograph! Once that has been done, you are ready to take your very first photographs – hooray !! 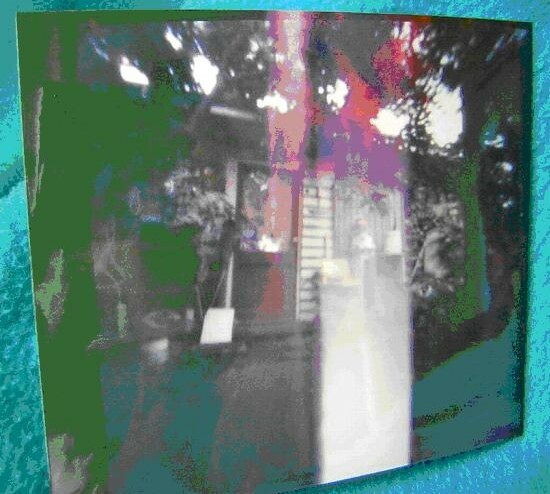 Examples of my first pinhole photographs! I’m only including two photos here as an example for you. 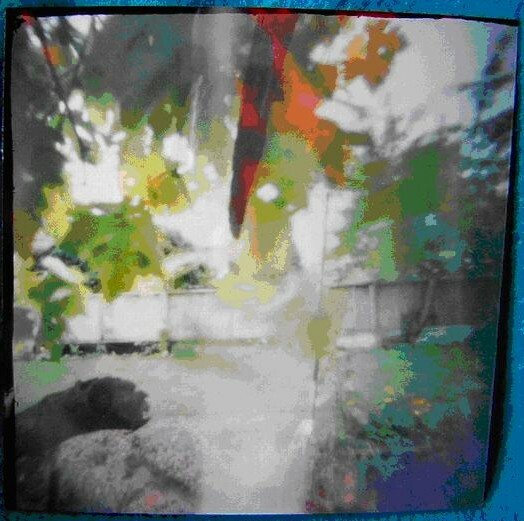 At the time of writing this, my scanner had given up the ghost as they say, so I had to make do with taking photos of the pinhole photos, if you see what I mean! How to use your camera. Using your camera is simplicity itself. 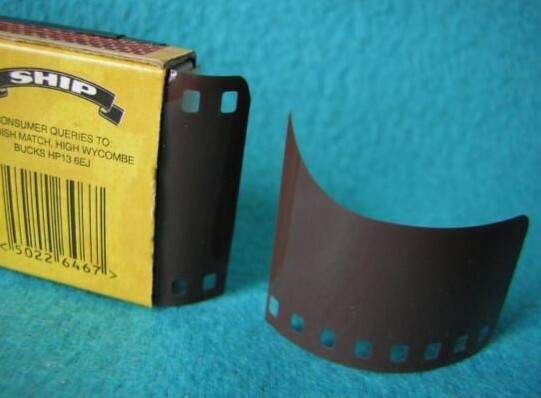 All you do is to first of all wind your first frame on, by counting the number of clicks you hear when turning the little knob on the take-up film cassette. In my case, the number of clicks was 6, ie. six clicks signify that the first frame is ready to be exposed, another six clicks mean the second frame is ready and so on. At the 6th click, stop winding and then position your camera wherever you are going to take your first photo. How do you judge the time required for each exposure? Good question! The answer is, with difficulty! You will be relieved to hear that as this is photography at it’s most simplest and creative, there are hardly any rules, and you can actually make them up as you go along! Whatever worked for me, may not work for you, as the conditions I used the camera under, may not be the same as the conditions you will be using. But, what I can do is to point you in the right direction at least. The majority of the photos I took were outside – quite a bright day but no sunshine. On days like that, I held the shutter open for around 1 or 2 seconds roughly. When being used inside the house or in other darker areas, I just randomly doubled or even trebled the shutter open time; in very dark areas or at night, you can safely leave the shutter open for anything from 1 to 5 minutes; trial and error will be your teacher here! But that’s half the fun, isn’t it? You will get to judge the correct times yourself when you take a look at your first film after it has been processed. I am sure you will agree that the project has been very relaxing and full of creative action, and it may well have given you even further ideas to experiment with, which is all part of the exercise! As for me, I have already decided upon my next project, which will be just as interesting as this one, and I will let you know the details once I have completed it successfully! How to use household products to process your film! Greetings from merry England, folks! You know, I get many, many emails from readers complaining that they either can’t get the right chemicals for processing their own films, or chemicals are too expensive, or more commonly, they just cannot buy any in their particular country. That’s a sad state of affairs. I know lots of my readers live in what we all euphemistically call the 3rd world…places like Africa, some places in India, Mongolia etc…you get the idea. 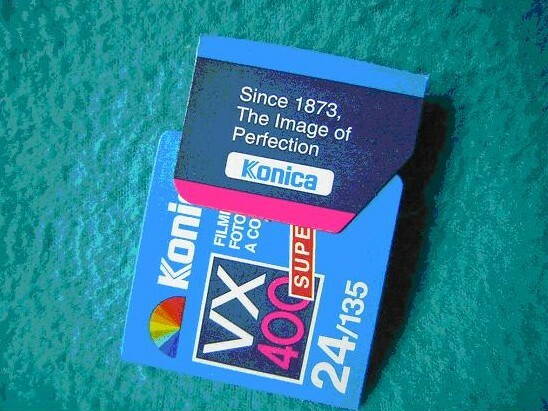 And therein lies the conundrum….it’s from places like those that our staunchest followers come from, as they not only prefer film, but more to the point, they just cannot afford to go digital. Without these guys, film usage could drop to an all-time low. Furthermore, it’s really frustrating that some countries don’t allow photographic chemicals to be shipped in the postal system, for obvious reasons. As a supplier, that creates headaches for me too…I often ship darkroom chemicals to far away places…Morroco, New Zealand, Fiji are some that I have shipped to….but either by some quirk of the postal systems or by sheer chance, those products have gotten through and delivered ok! On some occasions, delivery has been refused. So it’s a catch-22 situation really, with the end-user caught out as a result. Must admit though, that the number of non-deliveries is fairly low…I’d say out of 10 shipments, 1 or 2 get impounded. So anyways, I’ve been talking to my friend here in England (he of the subminiature 16mm cameras! ), and he explained an easy system of processing monochrome films at home, without darkroom chemicals…no, I’m not pulling your leg, mate..as they say here! In short, he uses just 2 items, which are in your kitchen right now most probably…..coffee and washing soda! That’s all he uses! He explained it all in layman’s terms…with film processing, there are 2 main essentials you need to carry it out…what he describes as a developing agent and an activator…in our case, the developing agent will be coffee and the activator will be washing soda. After the 25 mins developing time, pour in clean water 4 or 5 times….the process is done…easy as 123! 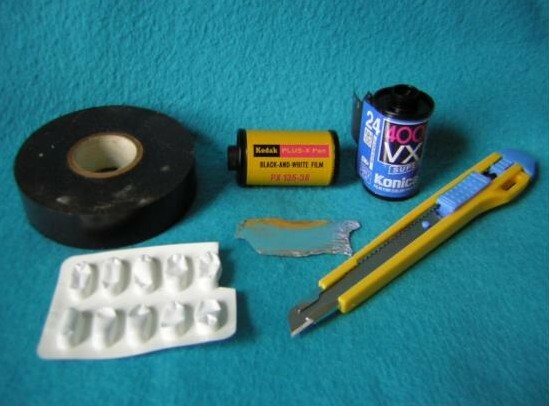 The mixture above is good for 1 roll of 35mm or 120 film…beacuse it is rather an unstable concoction, it will degrade quite quickly, so not really worth storing it…it’s dirt cheap to make anyway. However, please don’t all rush out and mix up your solutions to dunk your precious films into…there is a certain amount of experimenting involved too, as you have to try to determine yourself, the exact amount and mix of the chemicals and development time required for our particular film..did I say it was as easy as 123? The mix above has been tested with Ilford HP5 film shot at ISO 100. There we go, folks! If you just cannot get your hands on the proper chemicals, use this method…rather this than just sit and cry your eyes out, eh?